Here is the saddest Cubs fan, Marty McFly. 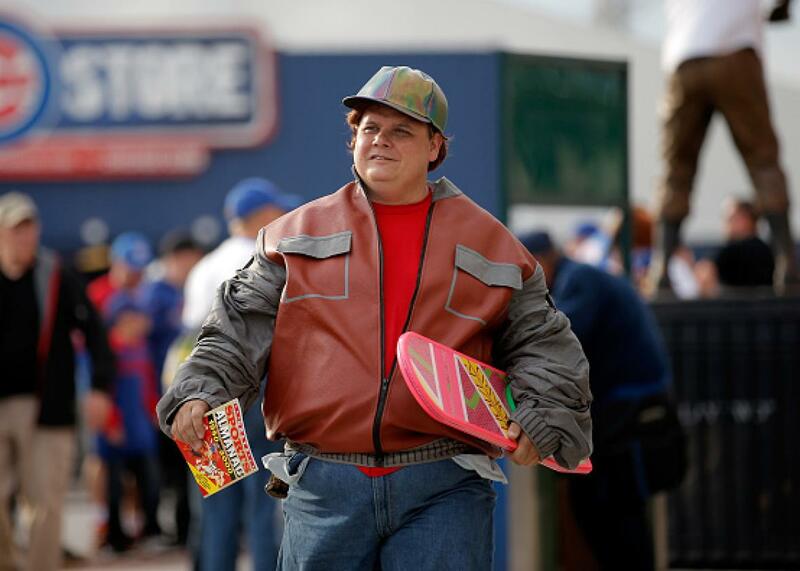 A Chicago Cubs fan dressed as a Back to the Future’s Marty McFly walks outside Wrigley Field prior to game four of the National League Championship Series on October 21, 2015. He knows what future awaits. He knows. After the Chicago Cubs—who have not been to a World Series since 1945 or won one since 1908—lost game four of the NLCS to be eliminated from the postseason by Daniel Murphy’s New York Mets, Deadspin was quick to post a comprehensive gallery of sad, sad Cubs fan. We think, though, that we found the saddest Cubbies fan of them all. Here he is seen heading to Wrigley Field before Wednesday’s decisive game 4 dressed up as a character from a 1989 movie film that predicted Wednesday would be the day the Cubs finally won their first title in more than 100 years. Notice the far-off stare in his eyes, the languid gaze of a soul that dreamt Hollywood fates foretold might be true, but deep in his heart knew the real truth. That is a man who could see the future, one that resembled so many desperate pasts. But, hey, there’s always next year!